Eight years ago I witnessed a scene similar to this one during a two-month field trip to Alaska with friends. 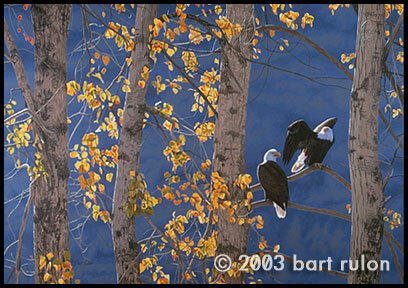 Bald eagles were lined up all along the edge of the Chilkat River, feeding on salmon. This was one of the most memorable scenes we witnessed in Alaska, and I knew it would become a painting someday.